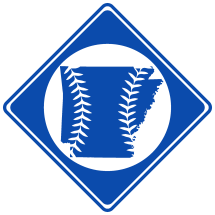 Henry Peel Hotchkiss, born October 8th, 1889 in Desha, AR, was a professional baseball player. He appeared with the Guthrie Senators in 1910. Hotchkiss attended the University of Arkansas where he played baseball. In the 1910 Census, Hotchkiss' listed occupation is "Base Ball Player". Coincidentally, Henry's brother Hubert's occupation is the same, but there is no known record of Hubert ever playing professionally. Hotchkiss died in 1965 and was buried in Resthaven Memorial Gardens in Duncan, OK.
3) Hotchkiss' Find-a-Grave Page .